Mens Rings, Kaisilver Crafts Quality Rings For Men In Gold And Silver. Recent years have seen a surge in the demand for men's rings and the news is that, quality does matter to the modern gentleman. Gone are the days when men did not care for jewelry or did not care for style and quality when they did. Kaisilver had been at the forefront of the quiet revolution that has taken place on the men's jewelry scene. We not only took the initiative to develop the first professionally designed and crafted collection of men's gold and 925 silver rings but also, went on to explain what quality jewelry and gems mean to men. The results were amazing and many jewelers fumed and grumbled because, they had to work that much harder on design and craftsmanship. The popularity of Kai Silver men's rings in more than 12 nations is the result of the devotion and passion, of some of the finest artisans, gem cutters and production experts in our production facility. Having said that, men's gold and 925 silver rings that we create are not made just to look good and handsome - we build in features that enhance the long term durability of the jewels too. Many jewelers might tell you that the 20-25 gram metal weight, invested in most of our rings for men is an unnecessary load on the price tag but, the fact is that a healthy metal weight is one of the essential features to ensure that a durable is sturdy and durable. An impressive concept for a men's gold or 925 silver. Fine craftsmanship and handpicked gems for the gold or 925 silver ring for men. Shown here with a checkerboard amethyst gem but, available with all gem stone options ... more. Big mens rings in the 12 to 15 size range have some typical requirements that, can best be fulfilled if custom made. Our detailed report on large plain or gem stone rings for men, has some high utility suggestions ... more. 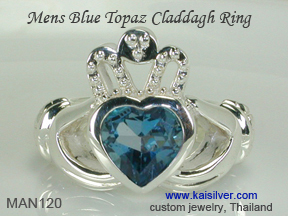 MAN120 A sturdy men's gold or 925 silver ring, london blue topaz claddagh ring for men. Widely accepted as the most meaningful jewel in history, this ring maintains all the essential meaning of the first ring made 4 centuries ago ... more. 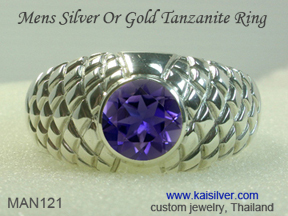 A handsome men's silver tanzanite gemstone ring, fine craftsmanship and handpicked natural tanzanite gemstone. 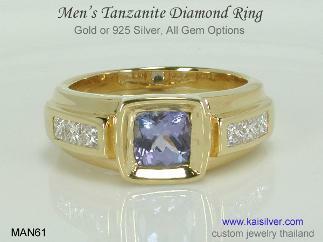 This men's tanzanite ring is custom made in gold or 925 sterling silver and is available in all ring sizes ... more. A very contemporary look for this men's ring with green jade. 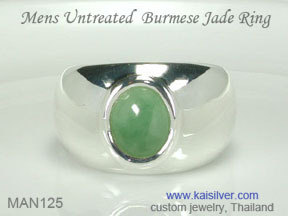 The handpicked green jade gem for the gold or 925 silver men's ring, is mined in Burma. Moderately priced natural and untreated jade is used for the ring ... more. Men's sapphires can do wonders for your personality, the gem is surely one of the most popular gem to be used in jewelry. 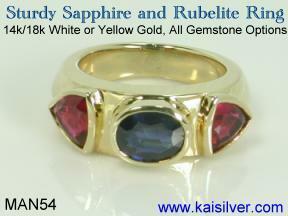 When ordering your sapphire ring for men from Kaisilver, you can pick from a range of sapphire colors ... more. 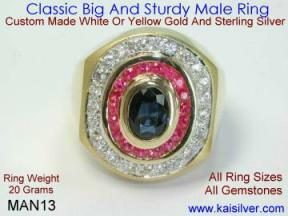 You can order this handsome men's ring in the size required by you. 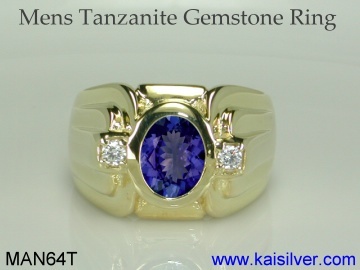 Shown here as an awesome men's tanzanite gemstone ring, the ring can be crafted with the gemstone of your choice. Get the same impressive quality for the 925 sterling silver or the gold men's ring ... more. MAN54, a men's sapphire ring that has style, durability and class. 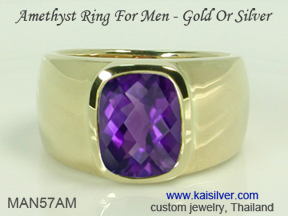 This fine men's gemstone ring is crafted in silver or gold in ring sizes with, all gem options. The ring boasts of many inbuilt features to enhance durability ... more. A gold or silver men's ring with an oval spessartite garnet nested in the center. 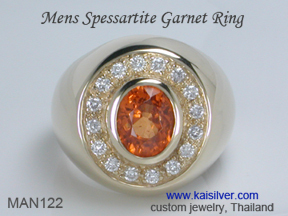 You could choose diamonds or white sapphires for the stones around the center spessartine garnet gemstone. Available in all 3 gold colors ... more. 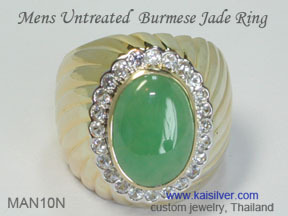 A men's green jade ring with a timeless appeal, the center natural Burmese jade gem is surrounded by white sapphires. The design for your gold or sterling silver men's jade ring can be modified as per your requirements ... more. A men's gemstone and diamond ring, take your style statement to the next level. 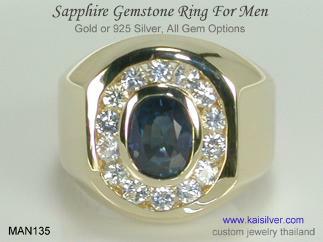 This custom men's sterling silver or gold ring has a cushion tanzanite gemstone in the center. On either side are diamonds to give the ring a lavish look ... more. 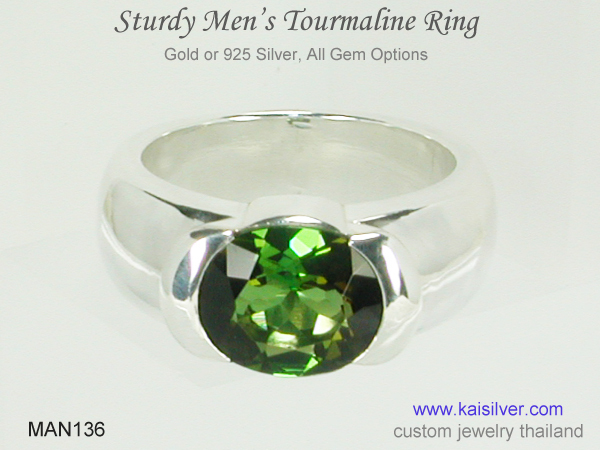 Invest in a hefty men's green tourmaline ring, custom made in gold or sterling silver with a large oval 11x9mm green tourmaline gemstone. The ring is configured to be durable and last for a very long time. Wear the ring to a formal or informal occasion, a must have jewel ... more. Each ring is custom made to include all buyer preferences, we do not rely on ready molds and semi-processed metal mounts. The designs can be picked from our website or can be provided by the buyer, all design modifications can be accommodated. When it comes to gemstones, few jewelry providers can match the reach that we have in terms of depth and width. Besides having preferred access to over 200 million carats of cut and polished gems, we maintain direct contacts with gem miners in almost every mining site in the world. The gemstone that is set in every men's ring is handpicked and carefully inspected before being set to the gem setting team. Custom cutting is done for all gems that need to be cut from rough mined material. We place no limitation on gem selection for all our gemstone jewelry including, custom men's rings. There is absolutely no need to limit your gem selection to what you see on our website as, we can procure and custom cut any gem from any part of the globe. Our expert team at sales@kaisilver.com can be contacted for any questions and requirements that you might have. Please do not be in a hurry to make a purchase until, all your questions have been answered and you have complete information. Since you can draw on the expertise of our team without making any commitment to purchase, make sure that you take advantage of their skills and knowledge.